Walking is good for our health, and can improve perceptual comfort in virtual reality (VR) applications. Similar to car sickness, VR simulator sickness happens when what our eyes see differ from what our bodies feel. Redirected walking is a technique that guides users to walk in a physical environment while they perceive a virtual environment via head mounted displays (HMD). A key challenge for redirected walking is to keep users safe without bumping into other stationary or dynamic objects while bridging the size and shape differences of the virtual and physical environments. In particular, virtual environments are usually large and rich, and yet the physical rooms are often limited due to real-estate space and tracking equipment. This project significantly expands the allowable size difference between the virtual and physical environments by exploiting temporal blindness in human visual systems. We look specifically at saccades, which are rapid eye movements during which the visual signals are temporarily blocked but not perceivable due to brain interpolation. Thus, during saccades, we can change the virtual cameras inside the HMD to nudge users walk in the desired directions (e.g. away from walls) without them noticing the camera changes. 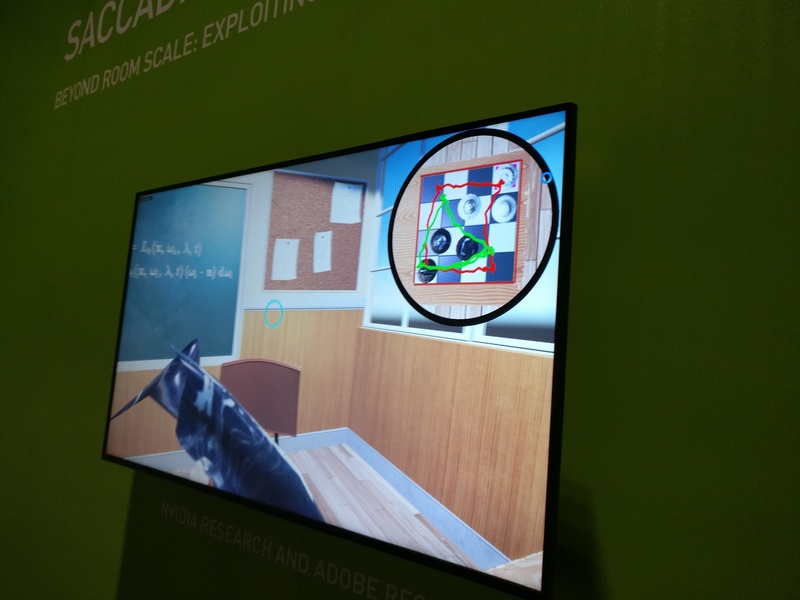 As a collaboration between Adobe, NVIDIA, and Stony Brook University, this technology has been demonstrated as a live demo in GTC 2018 via a chess game. As shown in the left image, a user wearing a HMD is being guided by a researcher. She can perceive a virtual classroom inside her HMD, while being guided by our system to walk on a virtual chessboard, as shown in the right image. The overlaid image on the right shows the virtual path (in red) and real path (in green), which can be very different and yet non-perceivable by the user. 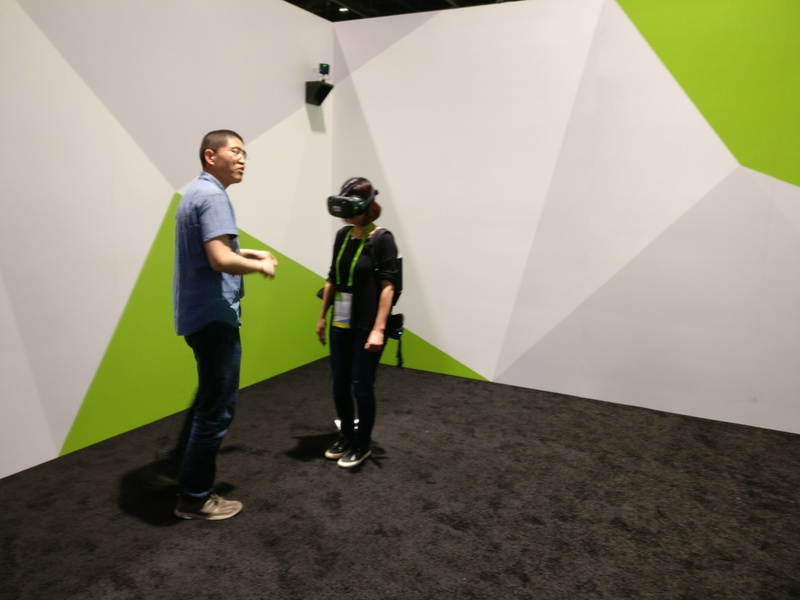 This technology makes room-scale redirected walking in VR more feasible, so that one day users can play a large virtual online game while walking around in their small physical rooms. We will talk about more details in an upcoming technical paper in SIGGRAPH 2018.